Central Washington U Scholars Quiz Author on The Bottom of the Sky! Wm Pack Signs Sky for Children's Literacy Charity!! Reach Out and Read charity benefits from private Sky signing! Encore 3rd Signing! at Barnes & Noble ManBeach! 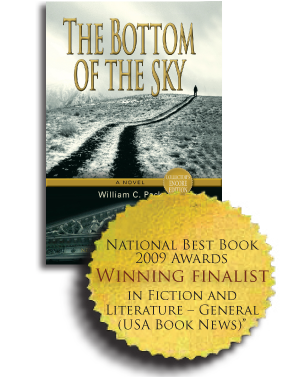 Author William Pack signs The Bottom of the Sky, National Best Book 2009 Award Finalist - Borders Books, Colorado Springs! Author William Pack signs The Bottom of the Sky for charity Reach Out and Read CO at Barnes & Noble Colorado Springs! Author William Pack signs acclaimed The Bottom of the Sky for charity Reach Out and Read CO at Barnes & Noble Denver! Mark Hopkins Hotel on Nob Hill. Bill Pack at Borders Bookstore Billings, MT. Interview with nationally syndicated radio host Chris Messina - playback schedule on 50 radio stations. More details to follow.